The love depicted in tv series Calikusu (Wren) has become true. 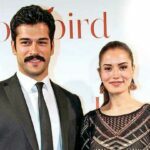 Burak Ozcivit and Fahriye Evcen have been together for more than 2 months. The couple will take part in a romantic movie soon. You are great actors and very wonderful good looking too… best of luck and best life to you two. great television series. Read the book a bit different but liked the series best. Good job. I have Fallen in Love with this Beautiful Couple after watching Love Bird!!! I was Heart broken until I read they have become Engaged and will Marry in June 2017!!! Most Love and Happiness To Burak and Fahriye…..FOREVER! !